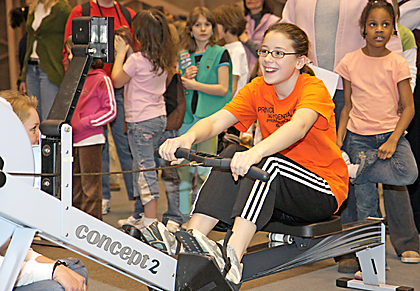 RIDING A CONCEPT: Princeton resident Caleigh Dwyer gets physical during Saturdays celebration of National Women in Sports Day at Jadwin Gym. Sponsored by the PU Department of Athletics, the event featured various Tiger student athletes sharing their sports know-how with local youths. Gov. Jon S. Corzine was in Hightstown Saturday during a Mercer County stop on a 21-county, statewide tour, shopping his proposal to increase tolls on the state’s busiest highways to offset state debt and to fund transportation initiatives. Despite meeting widespread resistance, the governor reasserted his challenge to the Legislature to find an alternate plan for digging the state out of debt. Princeton Township Committee agreed Monday night to assemble a working group designed to explore the viability of preserving character in a 34-home, mid-century development in the town’s Littlebrook section. Township Committee got its first taste of the municipal engineering department’s annual capital budget request for 2008 road improvements Monday night, and aside from some minor concerns, the $2.85 million project appears to have enough votes to pass. Koto, Mrs. Ijangayanga (a dragon! ), Kit, Edwina, and Kinji will be part of the festivities when The Arts Council of Princeton observes Black History Month on Sunday, February 17, from 2 to 5 p.m. This event is free to the public and will be held at the conTEMPORARY Arts Center, located in the Princeton Shopping Center. In December 2004, Karen C. “Casey” Hegener cast her final vote on Township Committee at the end of a three-year term. It wasn’t exotic: it was just a “yea” vote for an ordinance on dog vaccinations. “There is no one way to do it,” counseled Special Education Supervisor Eileen Sanchez at the beginning of last week’s meeting of the Princeton Special Education Parent Teachers Organization. In the hour that followed, four teachers from the Princeton Regional School District demonstrated just how fine-tuned and varied they have made their efforts to reach students with special needs. Lee Jubinville and his teammates on the Princeton University mens hockey team had reason to be concerned as they found themselves trailing Brown 1-0 heading into the third period last Friday. When the Princeton High girls hockey team faced Princeton Day School in mid-January, PHS star Haley Thompson couldnt play due to a dislocated shoulder.